With the booming population, cosmetologists and other beauty professionals are in high demand. 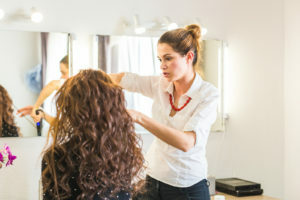 One of the great things about cosmetology is the flexibility that comes along with it; because beauty services are requested in the evenings and weekends in addition to normal daytime hours, many cosmetologists are able to create a "non-traditional" work schedule that allows them to work during the days and times they prefer. This also typically means that earnings can be dependent on how much a cosmetologist works. The national median salary for a cosmetologist is currently $24,300 per year, according to the Bureau of Labor Statistics (BLS). How Much Does a Cosmetologist Make? Cosmetologists most commonly work in spas and salons, but they can also be self-employed. Other employers may include beauty or fashion magazines, haircare and cosmetics companies, and the entertainment industry. Salaries can fluctuate wildly between these industries. Even within spas and salons, a cosmetologist can earn significantly more at popular, upscale establishments. It stands to reason that a cosmetologist with lots of experience will earn more money than one who is fresh out of beauty school. The good news for newbies is that by building up a good base of clients and a sterling reputation, wages and tips will only go up, and you may have a better chance at landing a job in a posh salon or other establishment. Payscale reports that cosmetologists typically earn anywhere from $16,195 to $46,917 annually, with experienced, senior-level cosmetologists earning at the top of that pay range. How Much Does a Cosmetologist Make an Hour? Cosmetologist salaries can vary significantly from one state to the next, and many cosmetology students are curious about how much they will be earning once they graduate from beauty school. The BLS reports that the national mean hourly wage for cosmetologists lands at $14.23, as of May 2016 (latest available data). However, to give you an idea of how wages can fluctuate, the mean hourly wage for a cosmetologist in Tallahassee, FL is $20.66, while the mean hourly wage in Akron, OH is $11.76. This goes to show that it's a good idea to thoroughly research average salaries in your state and region to get a true picture of what a fair cosmetology wage is for you. Location plays a big role in how much a cosmetologist can earn on average, though as we discussed above, there are so many factors that can ultimately affect your pay. Our salary table below will help you pinpoint how much you can expect to make in your particular state. Use this as a guideline for determining average cosmetology salaries.